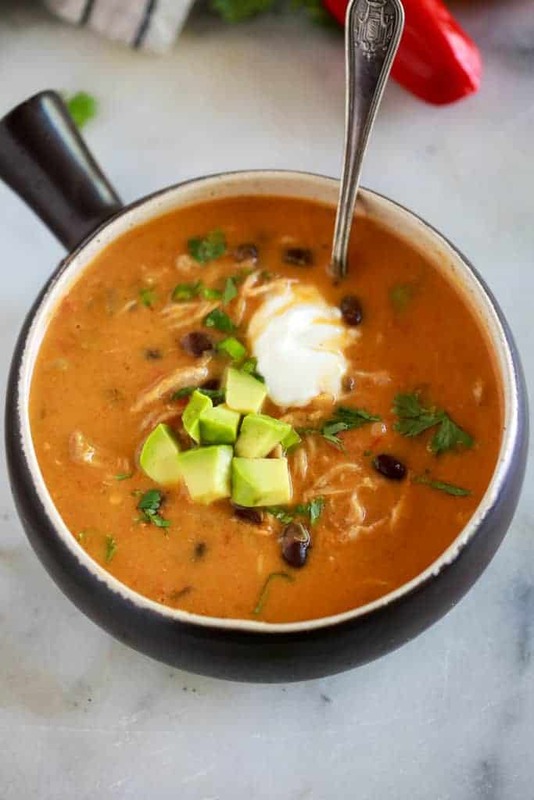 This delicious Chicken Enchilada Soup is made from scratch (NO canned enchilada sauce! 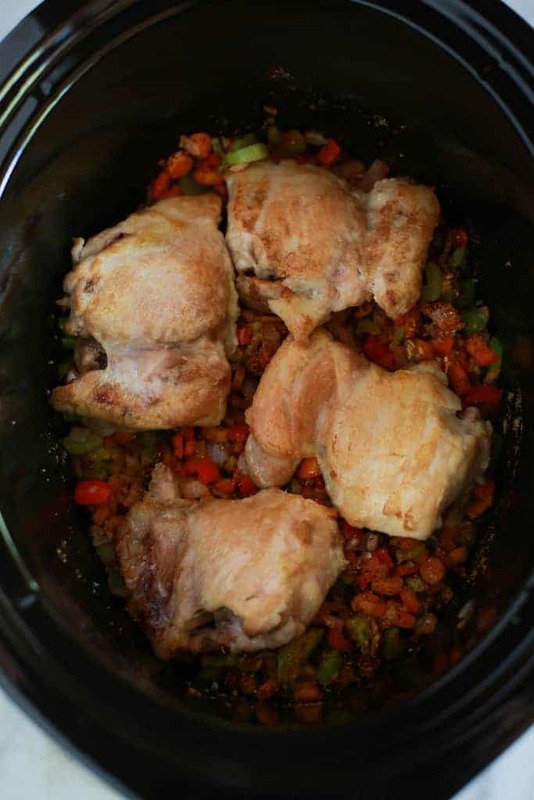 ), in the slow cooker and it’s loaded with vegetables, protein, and AMAZING flavor! It’s finally soup season! I’m that person that could live off of soup every single day–I love it so much. Soups are great for sneaking in veggies for kids and they always taste comforting and hearty! 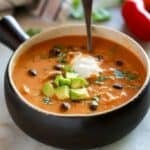 I particularly love this slow cooker chicken enchilada soup because it uses all fresh ingredients. I don’t know about you, but I rarely have canned enchilada sauce on hand–with this recipe, you don’t need it! And it tastes WAY better from scratch! First saute your vegetables in a hot skillet with a little oil. Add them to the slow cooker, and then brown the chicken in the same skillet, on high heat. Add the vegetables to the slow cooker, and stir in the spices, chicken broth and diced tomatoes. Add the chicken thighs and corn tortillas. Cook on high for 3 hours, and then remove the chicken and shred it. Blend the soup until it’s smooth, and then stir in the shredded chicken, green chiles and black beans. Add some cream for creaminess and thickness (if desired). This soup is so easy to make–you probably have all the ingredients and spices already on hand! I also love this soup because it has fresh corn tortillas cooked in the broth. They make it flavorful, thick and absolutely delicious! 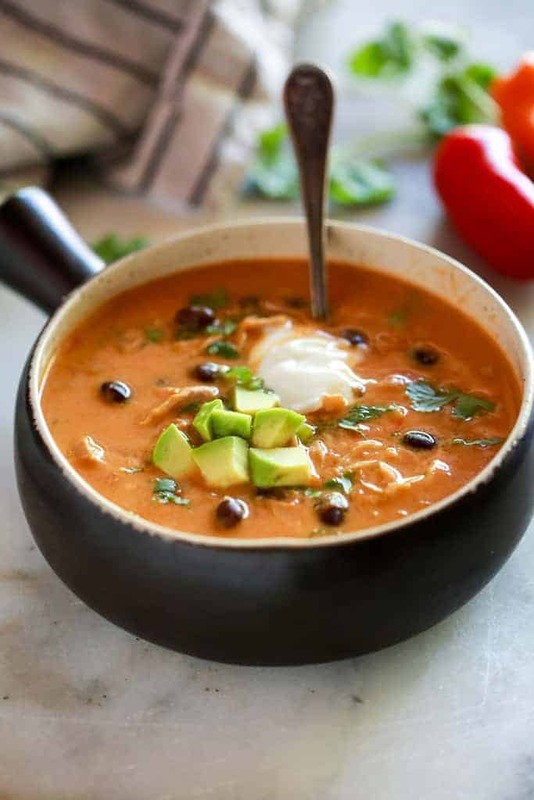 This delicious Chicken Enchilada Soup is made from scratch (NO canned enchilada sauce! ), in the slow cooker and it's loaded with vegetables, protein, and AMAZING flavor! In a large saute pan, heat 2 tablespoons of extra-virgin olive oil over medium heat. 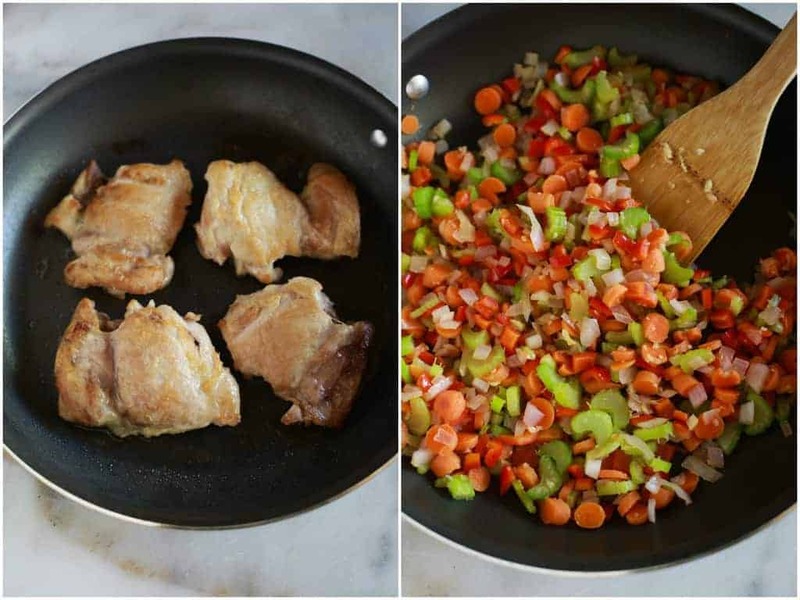 Once hot, add the onion, garlic, carrots, celery, and bell pepper and saute until fragrant and the vegetables are tender. Add to slow cooker, along with chili powder, cumin, coriander, oregano, and paprika. Stir to combine. Add the chicken broth and diced tomatoes to the slow cooker. In the same pan you cooked the chicken, add another drizzle of olive oil over high heat. Sear the chicken for 1-2 minutes on both sides, just until brown. Add to slow cooker. Add tortillas. Cook on high for 3 hours. Remove chicken to a plate, shred the meat and remove any bones. Ladle the soup from the slow cooker into a blender, in batches, and blend until smooth. Return pureed soup to the slow cooker, along with shredded chicken, black beans, and green chiles and cook for 1 more hour. Serve topped with green onions, sour cream, cheese, avocado, cilantro. I originally shared this recipe November 2014. Updated September 2018. Love everything from scratch ! This is so inviting one: keeping ! Chipotle powder in place of ground coriander and dried cilantro leaves instead of oregano made a soup that was gone before I could get half a bowl. Don’t be afraid to use what’s in your pantry , scratchers! And I know you don’t like nuts in your baked goods, my sweet, but, WOW, were chopped walnuts good in your oat bars w dark chocolate, cranberries and a 1/4 Cup less sugar. Love, love, love your website! Thank you so much Linlee! Those adaptions sound amazing!! Its a great recipe for the leftover thanksgiving turkey. I made stock and added fresh fire roasted anaheim and poblano peppers. Its delicious! Made this last night and my family really liked it. I added a little more chili powder as my kids are older and like the heat turned up a little. Thank you for all of your wonderful recipes.